Heat oven to 350°F. In large skillet over medium heat, cook bacon until crisp. Remove bacon from skillet; drain on paper towel. Discard drippings. In same skillet, brown ground beef and onion until beef is thoroughly cooked. Drain. Add bacon and all remaining ingredients; mix well. Pour into ungreased 2-quart casserole; cover tightly. Bake at 350°F. for 30 minutes or until bubbly. Traditional baked beans require overnight soaking of dried beans, then hours of simmering in a low, slow oven until the beans are tender and soaked through and through with the molasses-pork flavor. 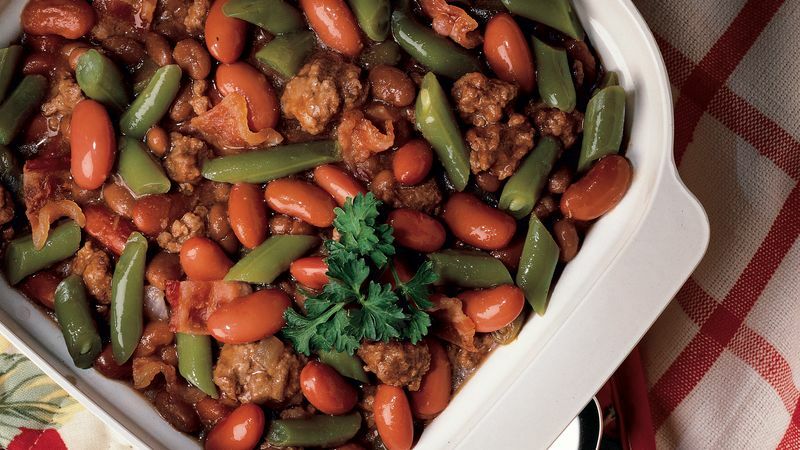 In the recipe below, using canned beans yields similar results in less than an hour. Forever popular because it's economical and quick to cook, ground beef varies in price according to the cut of meat from which it is made and the percentage of fat. Ground beef is labeled according to the ratio of fat to meat. High-fat ground beef is less costly per pound, in part because the fat cooks out and reduces the amount of cooked meat. According to USDA standards, ground beef may contain no more than 30% fat. As consumer awareness regarding fat has increased, so have products containing less fat. Ground beef can be up to 95% lean. Commonly found in supermarkets are: • 70 to 75% lean ground beef--Use when recipes call for browning, then draining, the meat. • 75 to 80% lean ground beef--Use when you want the meat to hold its shape and be juicy. • 80 to 85% lean ground beef--Use in recipes to reduce calories and fat.